Thanks to the guests from last week, it was another great week of Women in SF&F! The next week of guest posts begins tomorrow, but before announcing the schedule, here are a few reminders and links to last week’s posts. The Paradox trilogy giveaway has ended and there’s an official winner. Congratulations to Michele F.! 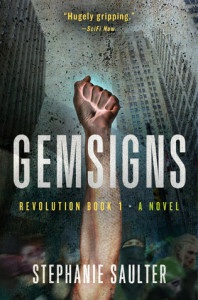 There’s now a new giveaway for 5 advance copies of Gemsigns by Stephanie Saulter (residents of the US are eligible to win). It sounds very intriguing and it’s now on my wish list after reading her guest post that went up yesterday! There is also still time to add some of your favorite books by women to create an even bigger list of SFF books by women. Last year, Renay from Lady Business asked us to enter some favorite speculative fiction books written by women to create a list of recommendations, and it resulted in a list of over 800 books with many books recommended by multiple people! Jaime Lee Moyer discussed her experiences reading science fiction and fantasy and finding books by women writing these genres. Heather from The Galaxy Express talked about science fiction romance and shared a variety of books in the genre that she has enjoyed. Ginn Hale discussed being told she “writes like a man” and the influence of gender in how an author’s work is received. Rinn from Rinn Reads wrote about the portrayal of female characters in science fiction and fantasy. Storm Constantine offered some advice on the craft of writing. Stephanie Saulter discussed gender in her novel Gemsigns and rewriting narratives.